Arsenal are already preparing for life without Alexis Sanchez, that is if reports in the media are anything to go by. According to Metro, the club has sent out scouts to look for a replacement for the Chilean international who is likely to depart at the end of the season. 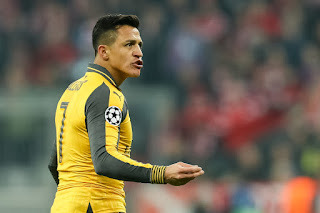 Arsenal have not been able to convince him to extend his stay beyond 2018 and if negotiations end up the same way it has been in recent weeks, they will have to let him go before he becomes a free agent. The Chilean is said to be demanding a £250 000-a-week wage but the club is not willing to go beyond £180 000. With his continued services at the Emirates now in doubt, the club are plotting a move for a mega star who will fill the void if he bids farewell. So far, the scouts have identified Porto striker Andre Silva, Borussia Dortmund’s Marco Reus and Lyon’s Alexandre Lacazette as possible replacements for Sanchez.